Willian is a wanted man. 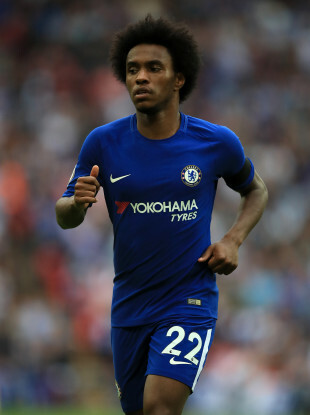 With Liverpool refusing to sell Phillippe Coutinho, Barcelona are now being linked with Chelsea star Willian. The Blues have already had to rebuff interest from Manchester United and Antonio Conte will be desperate to keep hold of the Brazilian after seeing several players leave this summer. In France, L’Equipe report that Paris Saint-Germain are closing in on another enormous deal to take Kylian Mbappe from rivals Monaco. However, one of Lucas Moura, Julian Draxler or Javier Pastore will have have to go in the other direction. After breaking their transfer record to add Colombian defender Davinson Sanchez to their ranks, Tottenham are believed to be nearing an agreement with PSG for full-back Serge Aurier. The Ivorian is available due to Dani Alves’ arrival from Juventus and he could join Spurs in the next 72 hours. Jonny Evans expects to be a Manchester City player by next week’s deadline. The West Brom and Northern Ireland defender will leave the Baggies for around £30 million after an initial bid of £18m was rejected. Benfica’s Peruvian international Andre Carrillo is having a medical at Watford today ahead of his loan move. The 26-year-old winger will spend the season with the Hornets, having worked with manager Marco Silva previously at Sporing Lisbon. In other news, Stoke have held talks with Club Brugge over an £8.5m move for Belgian centre-half Bjorn Engels. Elsewhere, Robert Snodgrass looks set to leave West Ham just eight months after joining from Hull City. Championship side Aston Villa and Sunderland are both battling it out for his signature. With Niall Quinn in the twilight of his career, Sunderland boss Peter Reid sanctioned a then significant £3.6m purchase of striker Lilian Laslandes from Bordeaux in the summer of 2001. Capped by France, it was hoped that the centre forward could replace Quinn but he started just five Premier League matches and his solitary Black Cats goal came in a Worthington Cup defeat to Sheffield Wednesday. Laslandes was shipped out to FC Koln six months into his career in English football and subsequently spent a period at Bastia before leaving Sunderland on a free to join Nice. Email “Willian on Barcelona's radar, Spurs near deal for PSG defender and today's transfer gossip ”. Feedback on “Willian on Barcelona's radar, Spurs near deal for PSG defender and today's transfer gossip ”.